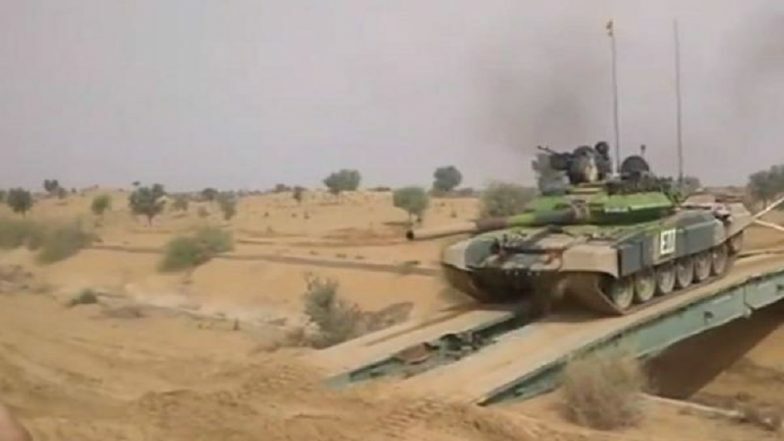 Jaipur, May 9: The Indian Army's 'Vijay Prahar' exercise in which over 25,000 troops of strike formation of South Western Command (SWC) participated concluded today. The month-long exercise was conducted in the Mahajan Field Firing Ranges of Jaipur close to Suratgarh in Rajasthan. The location of the exercise was only 300 kms away from the Pakistan border. The 'Vijay Prahar' was carried out with cutting-edge equipment and state-of-the-art force multipliers. South Western Army Commander Lt Gen Cherish Mathson witnessed the final offensive of the forces achieving a decisive victory. Lt Gen Mathson told reporters, “I had laid out unambiguous scope for activities to be carried out and had also benchmarked standards to be achieved. I am fully satisfied with the efforts put in and results achieved.” He further added that designing an offensive campaign on the principles of operational art in a deep air-land battle with real-time intelligence marked the beginning of the exercise. The concept of 'Air Cavalry' using attack and weaponised helicopters was tested during the exercise. Employment of modern-day sensors with weapon platforms was carried out. The exercise also focussed on real-time information and enhancing electronic warfare, reconnaissance capabilities and using satellite-based surveillance. Drones and radars were also put to test to check their efficiency with the aim to ensure transparency in the battlefield. Operations were carried to validate the preparation of the army under a tactical Nuclear, Chemical or Biological attack by the adversary with advanced CBRN capability. The Army and the Air Force came together to test their joint conventional firepower capability during the exercise. Lt Gen Mathson also complimented the troops who braved the soaring temperatures above 45 degrees Celsius and sandstorms to achieve a very high degree of proficiency.